Twenty-eight members of The Republic of China (Taiwan) Honour Guard will march in the Sept. 19 St. Kitts and Nevis Independence Day Parade. 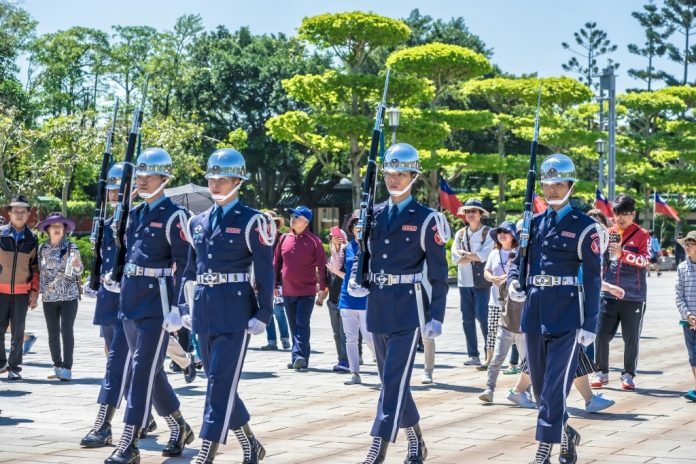 BASSATERRE, St. Kitts — The Republic of China (Taiwan) is sending a 28-member contingent of Honour Guards from the Taiwan Armed Forces to mark the anniversary of Independence of the twin-island Federation and the establishment of diplomatic ties between the two countries. During the Honour Guard’s Sept. 16 to 22 stay in St. Kitts and Nevis, on Sept. 19 the contingent is scheduled to participate in the 35th Independence Military Parade. The Ministry of Foreign Affairs in St. Kitts and Nevis and the Embassy of the Republic of China in St. Kitts plan to take the Taiwan contingent to Nevis on Sept. 20. Honour Guard personnel are provided from the three service branches of the Republic of China Armed Forces, the ROC Army, ROC Navy and the ROC Air Force. In Taipei, the guard is usually present at the Chiang Kai-shek Memorial Hall, the Sun Yat-sen Memorial Hall, and the National Revolutionary Martyrs’ Shrine. In Taoyuan, Honour Guard members are at the Chiu Presidential Burial Place and the Daxi Presidential Burial Place. The National Day Honour Guard Battalion is also made up of personnel of the Honour Guards companies of the aforementioned branches. St. Kitts and Nevis and the Republic of China (Taiwan) established diplomatic relations in 1983, making them mutually the oldest diplomatic allies.